Your steering wheel could save your life someday. 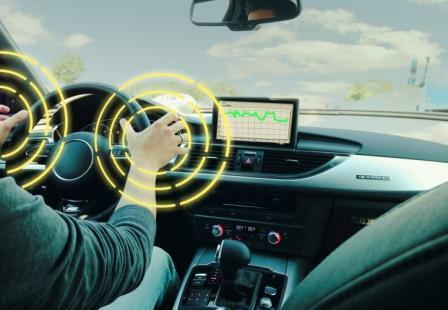 New sensor technology being developed by German-based Hoffman-Kippner will enable automakers to create steering wheels capable of monitoring their drivers — creating systems that would enable cars to call for help or even steer to safety or to a hospital during an emergency situation. Jens Kautzor, CEO of Hoffman-Krippner, told Design News that the applications of the technology are limited only to what the automaker can imagine. A resistive sensor embedded throughout the steering wheel allows it to detect a driver holding onto it. At the core of the new sensor technology, the result of over seven years of development, is Hoffman-Krippner's patented SensoInk and SensoFoil technologies that allow the company to screenprint a 0.8-0.9 mm-thick resistive sensor capable of measuring pressure, sensitivity, and position. According to Kautzor, the heart of the sensor is Hoffmann-Krippner's proprietary SensoInk — a pressure sensitive ink. "The more pressure you apply [to the ink] the higher the resistance," Kautzor explained. The sensor consists of this ink between thin layers of plastics. Pressure applied to the sensor (via gripping the steering wheel) creates a readable signal in the form of a short between the layers.